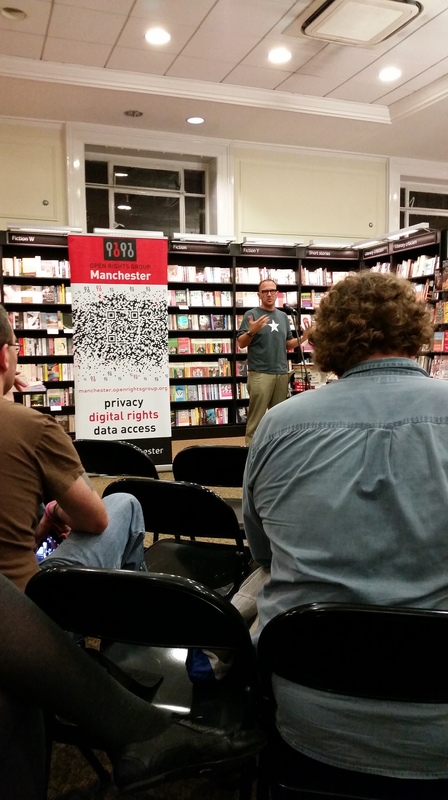 My first Manchester Literature Festival experience: Cory Doctorow ‘Information doesn’t want to be free’. 07.10.2014. I just wanted to let you know about the great talk I recently witnessed as part of this year’s Manchester Literature Festival. I received the booklet which explained all the MLF events and this one stood out for me. I hadn’t heard of Cory Doctorow before but what his talk was about, which covered the choices you make about your digital creativity resonating throughout the internet and three laws to abide by when doing so, sparked my interest. I’ve read plenty regarding copyright laws and what rights writers have when they decide to self-publish or are lucky enough to be signed up by a major publishing house and what they want when you sign a contract but hearing an expert talk about it was something I wanted to hear. The first law covered the locks that are put in place on something you own, mainly the thing you’ve created, and how it’s not really there for your benefit. As far as I was concerned before hearing this, I thought these locks are there to help. Digital Rights Management (DRM) is one lock that you would click before publishing with Amazon for example that would protect your creative product. Cory explained how easy these things are to unlock by saying that such locks were on DVD’s when they first came out and it was broken within 24 hours to allow any DVD to be pirated. Once the lock is in place as well, only the company that put the lock on can remove it. Not even the author can remove it once they agree to it. That sounds pretty scary to me. The Hachette Vs Amazon barnstormer battle came up and he explained how, with Hachette refusing to agree a new deal with Amazon re: sale of their products and such, Amazon have refused to sell any of Hachette’s stuff, which accounts for 40% of their annual turnover. Hachette has mandatory DRM on their products and some websites have this auto-selected when really, by the sounds of things, you shouldn’t use it. It’s akin to having armour round you work like wet tissue paper. The second law was that publishers will make you rich as long as you are already famous. I’ve read many stories whereby an author will be rejected by publishers, self-publish and sell a lot of books, and then make a deal with a publisher but make it tailored to their needs because they can live without the publisher. It does seem to me like trying to go it on your own is the better option and probably the more satisfying one. The third law was that information doesn’t want to be free. Information always seems to have some kind of cost to it. When it is put onto the internet, which is the Nervous system of the 21st century as Cory put it wonderfully (if you’ve heard that before, fair enough. But I haven’t so it was a wonder to me at the time) then it does seem like it would be easier to encourage people to freely share parts of their work which would in turn help the sales of the book in the future. This is something that Cory has done very well for many years. He explained as well about how computers seem to be everywhere nowadays. You carry a computer in your pocket (mobile phone) or an iPod or any number of things which can have its contents accessed by anyone if they tried hard enough. He said that in the future everything will run through the internet and that it was evitable. 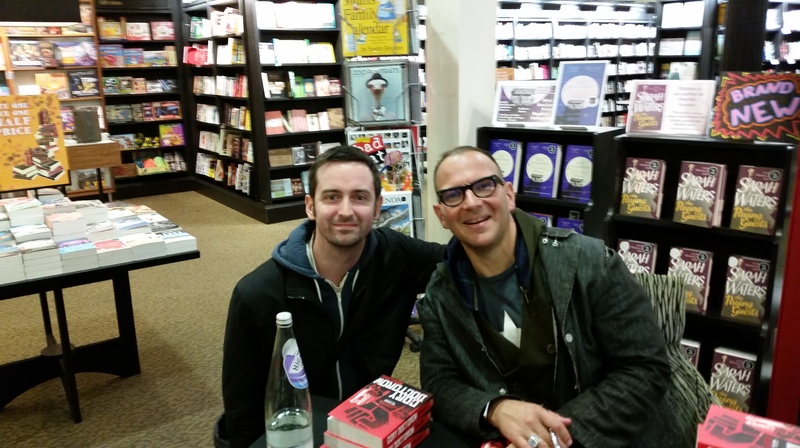 In conclusion I did enjoy the talk very much, even buying a book of his and getting a picture with him, and would advise anyone who wants to know more about copyright laws to seek out Cory Doctorow and his musings (http://boingboing.net/ and http://www.craphound.com amongst many) . To finish, here are a couple of pictures from the night. Thanks for reading.